The 2015 Cadillac Escalade has received numerous important interim-model updates, but until recently, only the pre-update models could be found on dealer lots. 2015i (interim) Escalades will be fairly hard to come by for the time being, but dealer supplies will become more abundant over the next month or so. 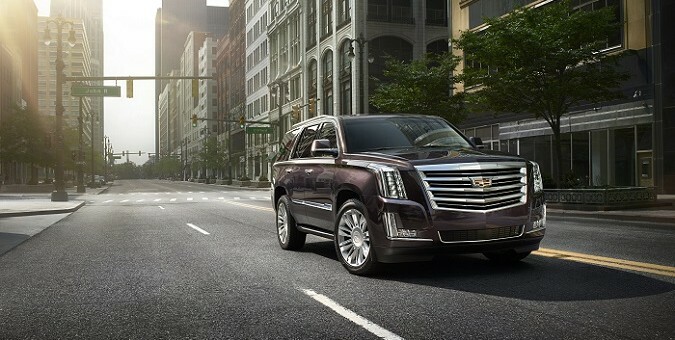 The most important update Cadillac’s 2015i Escalade has received is General Motors’ all-new 8L90E eight-speed automatic transmission, replacing the outgoing 6L90E six-speed. There’s also a load of new technologies such as OnStar’s 4G LTE Wi Fi hotspot, Siri Eyes free, wireless charging and Surround View, which provides an overhead view of the car and its surrounding area. In addition to the myriad of powertrain and technology updates, 2015i Escalades are available in Platinum Collection trim. They can also be spotted fairly easily, as all versions will be sporting Caddy’s more modern shield logo. They started building the 2015i Escalades on October 6, but none of them have shipped from Arlington Assembly due to various quality hold issues and a HUGE backlog of vehicles waiting to ship from the plant. They don’t have enough trucks to transport them from the plant to the rail yards and there aren’t enough rail cars to put the vehicles in. This is what I was told by GM Corporate. A dealer on eBay indicated a 2015i was “inbound” however their listing has since ended even though it was only posted today. Don’t forget that the side mirrors are bigger now, than before, with Galvani chrome strip. Perhaps there are ongoing assembly line issues that are causing the problem , not only here but other GM models , as well . The 2014 Silverado and Sierra trucks are seeing lots of complaints about squeaks and rattles . This has to be an assembly line issue , either on how the various components attach to the firewall , or cab weld points , or ??? This has to be a solvable issue , mechanically , but if the problem is caused by unprofessional care and attention by unqualified or uncaring assembly line personnel , this is a much more serious problem to deal with . Personnel hiring and training may be a factor or is the fact that some of these assembly lines produce more than one type of vehicle that cause confusion or stress in attaching a wide variety of components in different locations on an ever moving assembly line , the main problem ?? Does anyone know if Cadillac will offer a Diesel in the 2015 Escalade for the U.S market? As far as I know, no diesels are planned for the Escalade. A damn pity as the Escalades contemporaries offer them. A turbo 6 pot diesel would certainly raise its appeal, especially in Europe. Squeeks and rattles are usually not the fault of the assemly line workers. Before any new model leaves the plant , the workers are trained by building test mules on a slower line speed as to give the employees time to learn how to assemble the vehicle. These mules are taken off the assembly line and go back to the pre-production team so they can go over the vehicle from top to bottom and look for potential problems in the assembly of it . The engineers will follow the test mule from start to finish as well . Even representatives from the parts suppliers are there in case changes need to be made on their part of the vehicle . But all these people are human , and sometimes the best test is in the real world , and things can be discovered or have been overlooked . Alot goes into a vehicles build before any customer gets to drive that new vehicle home .